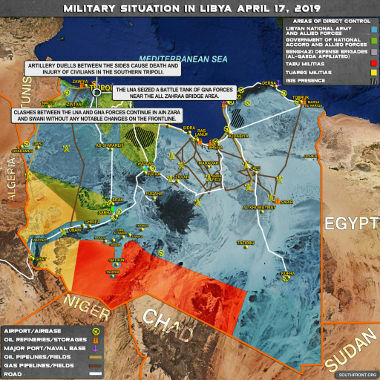 April 19, 2019 “Information Clearing House” – The Libyan National Army (LNA) troops of General Hafter attack the militias which support the UN recognized government in Tripoli from the south. The LNA still lacks forces for a larger break through. Several objects at the front changed hands several times. There are bloody skirmishes but no big fights. Those are still to come. It was never clear if Hafter really hoped that a lightning attack on Tripoli would achieve a fast victory, or if his sudden move was intended to rally support from outside. He is now certainly getting such support and that will be to his decisive advantage in the longer play. Since then the Wall Street Journal reported that Saudi Arabia pledged tens of millions of dollars to support Hafter’s move on Tripoli. During the last week Hafter visited President Sisi of Egypt. Europe is disunited over the issue. Italy wants to keep its influence in its former colony Libya and its historical position in the Libyan oil industry. It is also concerned about a new wave of refugees. It supports the government in Tripoli. France is supporting Hafter with an eye on taking over some oil business. It is also concerned about Islamist activities in former French colonies west and south of Libya. With Italy and France in a clinch, the European Union only issued a weak statement that called for a stop of fighting without naming any side. President Donald Trump spoke on Monday with a Libyan strongman whose forces are advancing on the nation’s capital, the White House said, in a move that may undermine support for the country’s internationally recognized government. 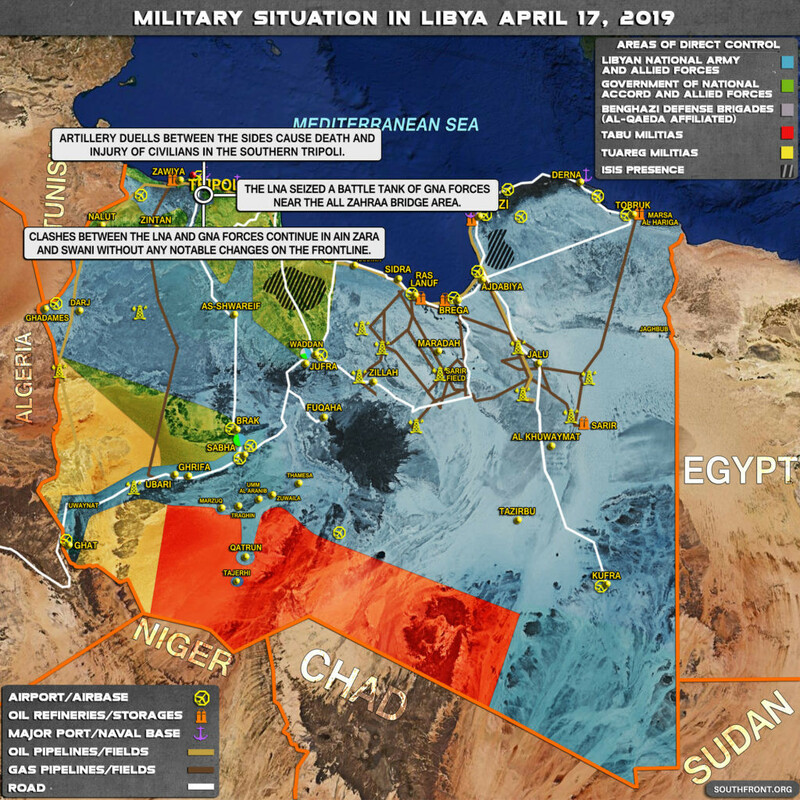 “The president recognized Field Marshal Haftar’s significant role in fighting terrorism and securing Libya’s oil resources, and the two discussed a shared vision for Libya’s transition to a stable, democratic political system,” Gidley said. The key point for Trump is the oil price. His administration put sanctions on sales of Iranian and Venezuelan oil. Since the beginning of the year crude oil prices rallied from the low $50 per barrel to over $70 per barrel. Trump plans to reduce waivers he gave to some of the countries that continue to buy Iranian oil. That would further decrease Iran’s output. Any additional disruption of Libya’s oil production would increase the oil price and harm the U.S. economy. It would thereby make Trump’s plan for total sanctions on Iranian oil impossible. Hafter controls most of Libya’s oil supplies. With open backing from the U.S., Russia and France, support from the military in Egypt, and with enough Saudi cash to finance his army, he surely has all the needed support to sustain a longer fight. His next move will likely be against the small air force the Misrata gangs assembled. The U.S. might give him a helping hand in that. Hafter could then close down the airspace for flights from Turkey and Qatar. That would cut into the resupply Misrata and Tripoli need for a longer fight. Those who say that “there is no military solution” to the situation in Libya will likely be proven wrong. Hafter has all he needs to win the fight. The one-day summit, hosted by Iraq’s Parliament speaker Mohammed al-Halbusi, brings together representatives from Iraq, Iran, Turkey, Saudi Arabia, Jordan, Syria, and Kuwait on Saturday. Speaking on Friday, the young Iraqi speaker welcomed the foreign delegations, describing Baghdad as a historical center of “Arabism, Islam and peace”. “Iraq, proud, prideful and victorious over terrorism, is honored by the presence of its neighbors in Baghdad,” he added. His deputy, Bashir Haddad, said the summit will have a “significant” impact on cooperation related to the region’s security and stability. 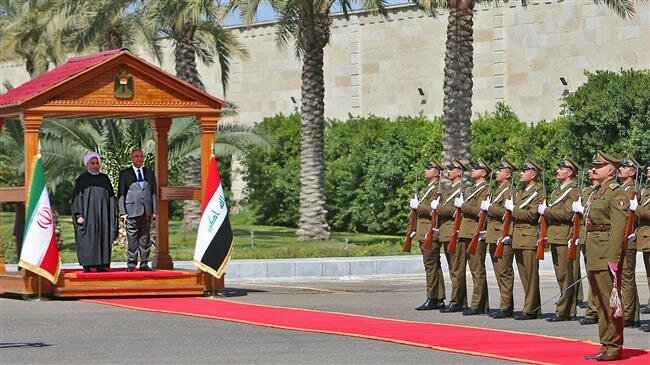 “This is a positive message to all neighboring countries and the world that Iraq is determined to regain its health and return to its Arab, regional environment and assume its rightful place in the map of the balance of power,” he added. Iran’s Parliament speaker Ali Larijani is represented by MP Alaeddin Boroujerdi, the former chairman of the chamber’s National Security Foreign Policy Committee. Larijani had initially planned to take part in the summit but was unable to do so due to a conflicting work schedule, reports said. The summit marks yet another important watershed in a recent booming of diplomatic cooperation in a region that was largely been bedeviled by bloody conflicts in recent years. Pakistani Foreign Minister Shah Mahmood Qureshi has briefed the media on steps taken by the country to strengthen security along its porous border with Iran a day before the Pakistani Prime Minister Imran Khan is due to arrive in Iran for a long-awaited visit. Qureshi told journalists in a press conference in Islamabad on Saturday that Pakistan had already taken “six steps” to ensure stability along the Iran border as part of a project dubbed the “border of peace”. He said a new command has been formed in the Pakistani city of Turbat to improve the effectiveness of border guards deployment in the area while a new Frontier Corps will be responsible for smooth management of the border. Qureshi said Iran and Pakistan had already started setting up joint border centers while agreeing to synchronize border patrolling exercises and carry out heli-surveillance to prevent incidents like those in the past that have affected security in the region. The top Pakistani diplomat also elaborated that a project to fence the entire 950-kilometer border between Iran and Pakistan had already kicked off from the points frequently exploited by terrorist groups. The announcement comes amid Iran’s frequent calls on Pakistan to ensure security along the border and prevent certain groups to cross the frontier and carry out acts of terrorism in Iran. Some 27 Iranian military officers were killed in February in an attack in Iran’s Sistan-Baluchistan region, Iran blamed groups active inside the Pakistani territory for the attack. Before arriving in Tehran, Khan will have a brief stop-over in the holy city of Mashhad on April 21. Qurashi’s remarks also came two days after some 14 Pakistani navy personnel were killed in an attack in a remote area of Pakistan’s southwestern province of Balochistan. Islamabad has said that a group which it claims is active inside Iran was behind the attack. Iranian Foreign Minister Mohammad Javad Zarif condemned the terrorist attack on Thursday, saying it was a sign that extremists and their sponsors were terrified by close relations between Iran and Pakistan. The border security between Iran and Pakistan will be a key theme of Imran’s imminent visit to Iran. The two-day trip will begin on Sunday with a short visit by Imran to the northeastern Iranian city of Mashhad before he comes to Tehran to hold official talks with the Iranian officials. Ansar Allah fired a Badr-F missile to the Hakula military camp, Dhale province. BEIRUT, LEBANON (5:15 P.M.) – The Houthi Forces shot down a massive drone over the Sa’ada countryside on Friday, the group announced this afternoon. According to the Houthi forces, they shot the drone after it was seen circling their positions near the Saudi border with the Sa’ada Governorate. The massive drone is suspected to be a Chinese-made CAIG Wing Loong unmanned aerial vehicle. Both Saudi Arabia and the United Arab Emirates (UAE) possess these drones in their arsenal.